The history of the pomegranate is as fascinating as its flavor and nutritional properties. Did you know that pomegranate remnants have been discovered in Egyptian tombs or consumed by Babylonian soldiers before they went into battle? These red fruits with a tough outer layer were also considered as a symbol of hope, prosperity and abundance in several cultures and as such were included in wedding ceremonies. Also known as the ‘jewels of winter’ in North America, pomegranates possess numerous health benefits which will be discussed in this article. 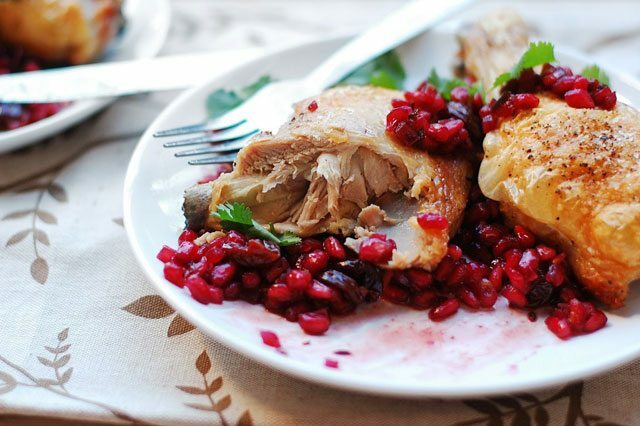 I’ll also share some of my favorite pomegranate recipes with you. Enjoy the read! 1. Pomegranates are impressive nutrient powerhouses. 2. Pomegranates contain two unique compounds. Punicalagins, potent antioxidants which are uniquely found in the pomegranate’s juice and peel. Punicic acid, a fatty acid present in the arils. It is also commonly referred to as pomegranate oil. Impressive fact: In one study, pomegranate juice was found to have an antioxidant activity three times higher than those of red wine and green tea! 3. Pomegranates can help reduce inflammation. Quiz time: Is inflammation always a bad thing? Although this may sound counter-intuitive, transient inflammation (one that flares up and then dies down pretty quickly) can actually be good news as it’s a sign that your immune system is working properly. However, chronic low-grade inflammation induced by psychological stress, a sedentary life, smoking, poor quality sleep and an unhealthy diet can spell serious trouble ahead. Insulin resistance which can cause accumulation of body fat and increased risk of diabetes. Leptin resistance – The hormone leptin regulates appetite and metabolism. When the brain’s hypothalamus becomes leptin resistant, glucose and fat metabolism are adversely affected, resulting in weight gain, difficulty to lose weight and insulin resistance. That’s a grim long list of serious health complications, right? So here’s some good news: thanks to the antioxidant properties of punicalagins, pomegranates can help combat low-grade inflammation and keep these bleak diseases at bay. Impressive fact: Consuming 250ml (about 8.5oz) of pomegranate daily for 12 weeks has been found to decrease the inflammatory markers CRP and interleukin-6 by 32% and 30%, respectively. 4. 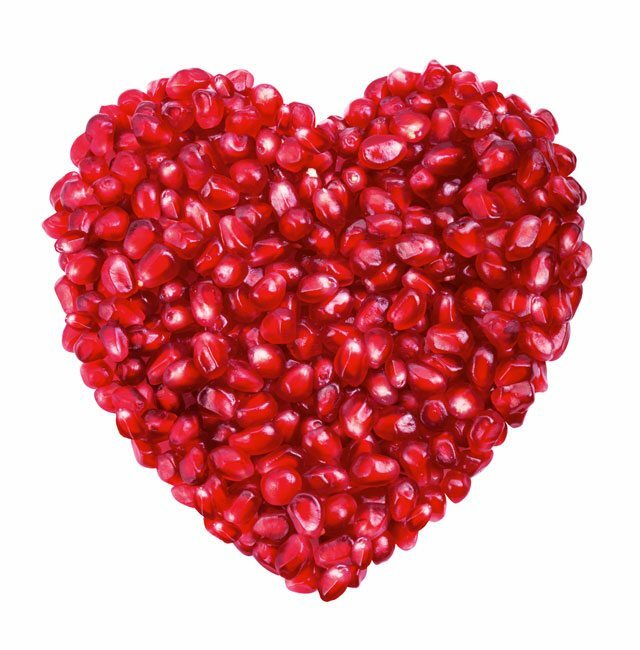 Pomegranates support heart health. Decreasing oxidative stress and damage to blood vessels due to inflammation. Punicalagins have been found to protect the heart by reducing inflammation and by helping quench the deleterious effects of free radicals on cell membranes. Promoting the body’s production and activity of nitric oxide. Nitric oxide is a substance with antioxidant and anti-inflammatory properties. It helps delay the progression of atherosclerosis (the hardening of arteries) by scavenging free radicals and preventing blood cells and platelets from clumping on the arteries’ walls. Preventing the oxidation of LDL molecules. Oxidized LDL molecules can injure the cells that line the coronary arteries – this can narrow the arteries and precipitate a heart attack. Impressive fact: Study participants who received pomegranate juice supplements containing 78 mg of punicalagins for one year experienced a 30% decrease in the size of atherosclerotic lesions in the common carotid artery. The lesions grew by 9% in the control group. 5. Pomegranates can reduce blood pressure. One of the factors that contribute to increased blood pressure is the overgrowth of undesirable muscle cells in blood vessel walls. Thanks to the punicalagins they contain, pomegranates can help prevent this dangerous muscle cell growth. 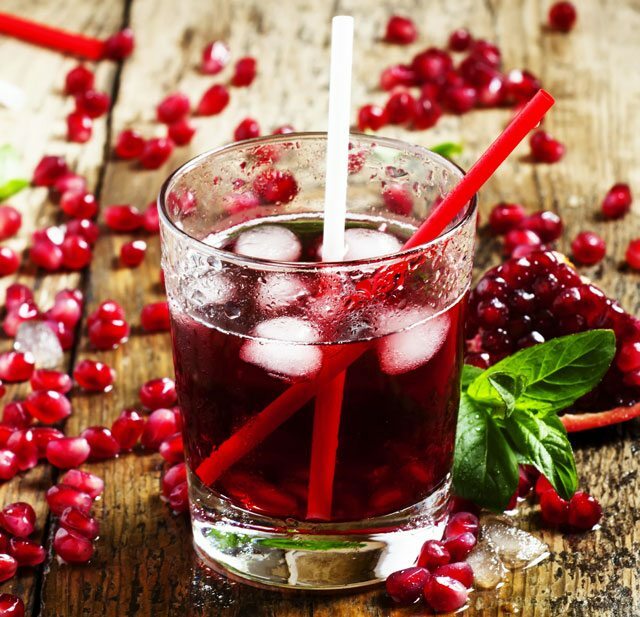 In fact, compared to grape juice, blueberry juice, red wine, vitamin C, and vitamin E, pomegranate juice was found to be considerably more effective. Impressive fact: Consuming about 150ml (5oz) of pomegranate juice daily for as little as two weeks was found to significantly reduce blood pressure. In another study, pomegranate juice supplementation reduced blood pressure by an impressive 21% after one year. 6. Pomegranates are beneficial for individuals with diabetes and the metabolic syndrome. Jordanian researchers have discovered that the antioxidants (particularly punicalagins and punicalins) in the pomegranate are able to tone down the damaging abrupt after-meal spike in blood sugar levels by reducing sugar absorption. They explained that these antioxidants can help the beta-cells in the pancreas store and release insulin more effectively. 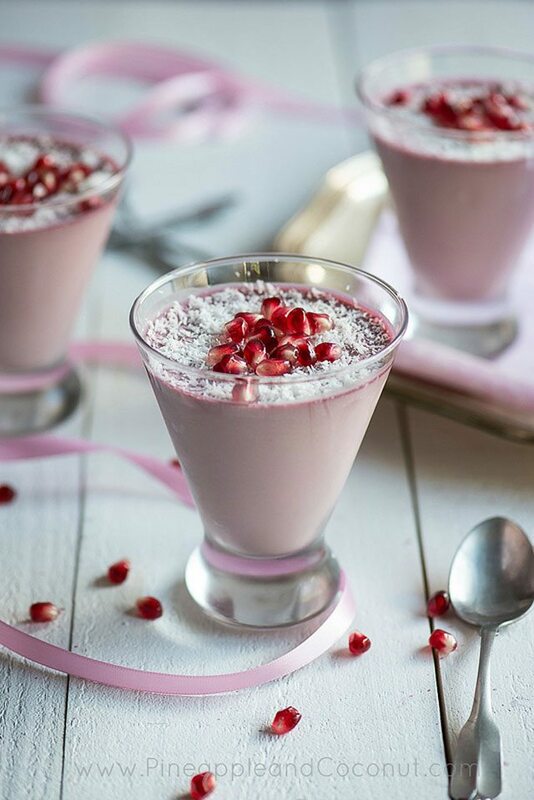 In another study, Iranian researchers found that pomegranate juice markedly reduces cardiac risk factors in diabetic patients: those who consumed 40 grams (1.41 fluid ounces) per day of concentrated pomegranate juice for eight weeks experienced substantial improvement in heart health. This is an important finding since individuals suffering from diabetes are at higher risks of heart disease. Impressive fact: Individuals with type 2 diabetes were given 1.5ml of pomegranate juice per kilogram of body weight. After three hours, researchers noticed improved beta-cell function as well as a decrease in insulin resistance in the study group whose average blood glucose levels was 8.5mmol/l compared to 9.44mmol/l in the control group. 7. Pomegranates can help reduce joint pain and prevent osteoarthritis. Interleukin-1b (IL-1b) is a molecule that leads to the overproduction of inflammatory molecules such as matrix metalloproteases (MMPs). Although MMPs are enzymes involved in tissue regeneration, when produced in excess, they lead to cartilage degradation that occurs in osteoarthritis. 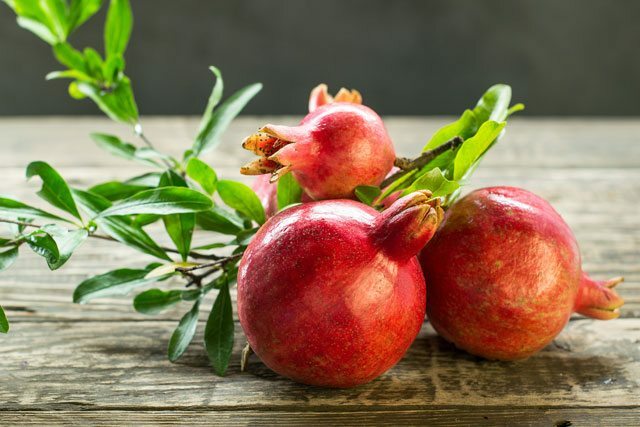 Thanks to its antioxidant and anti-inflammatory properties, the pomegranate has been found to suppress the over-production of MMPs and thus break the cycle of tissue damage. 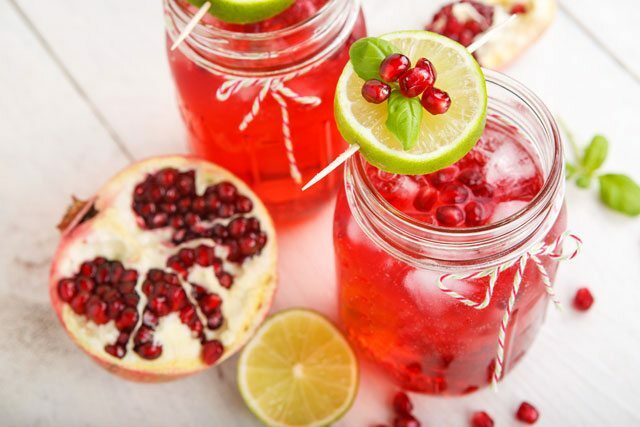 Impressive fact: Researchers have concluded that pomegranates can prevent the breakdown of cartilage while maintaining joint integrity and function. 8. Pomegranates can help avert Alzheimer’s disease. Beta-amyloid, a protein fragment, has been shown to destroy synapses (contact points via which nerve cells relay signals to one another) long before clumping into cells that cause nerve cell death. This results in declining brain function, notably in the ability to remember. The good news is that pomegranates can help slow down beta-amyloid accumulation and preserve cognitive abilities. Impressive fact: In a lab study, mice with Alzheimer’s-like disease were given pomegranate juice from 6 to 13 months of age. They accumulated about 50% less beta-amyloid than the control mice and were also able to exit the water maze 35% faster. 9. Pomegranates can enhance memory. Do you often have trouble remembering things? Besides getting enough quality sleep and keeping your blood glucose levels under control, research suggests that drinking pomegranate juice can significantly help improve memory even in the elderly. Moreover, taking 2 grams of pomegranate extract has been shown to reduce memory deficits after surgery. Impressive fact: Compared to the control group, study participants who consumed 8oz of pomegranate juice daily for four weeks experienced improved memory function and an increased brain activity during verbal and visual memory tasks. 10. Pomegranates offer protection against various cancers. Pop quiz: What are the most common types of cancers among men and women? While breast cancer is highly prevalent among women; prostate cancer is the most widespread type of cancer and the second leading cause of cancer death among American men. 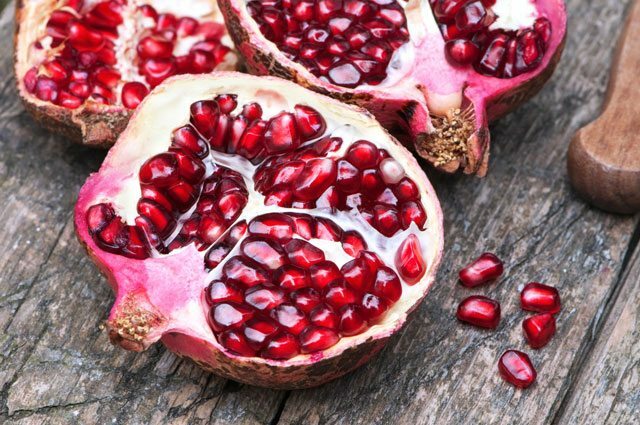 Research has shown that compounds in the pomegranate — including ellagic acid and luteolin—work together synergistically to inhibit cancer cell growth. 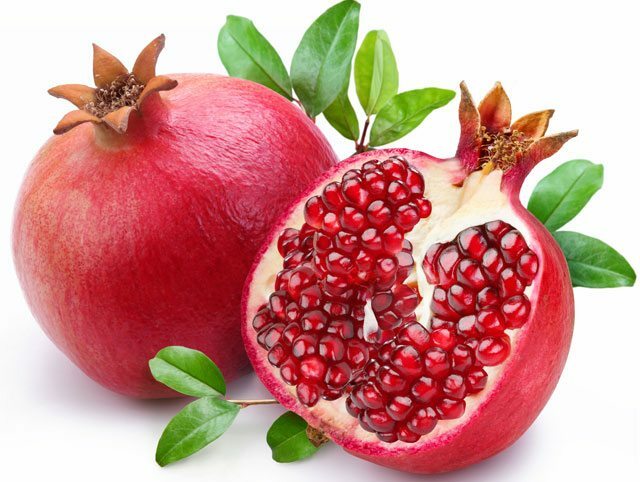 For instance, when human prostate cancer cells were exposed to pomegranate fruit extract, they immediately began to produce substances that led to their own death. That’s not all; consuming pomegranates can considerably help reduce blood levels of prostate-specific antigen (PSA), a marker used to monitor prostate cancer progression. In other words, pomegranates can not only help prevent prostate cancer but they can also slow down the progression of existing prostate cancer. Studies also indicate that pomegranates can prevent breast cancer cells from multiplying while others show that the ruby red fruit may even kill some breast cancer cells. 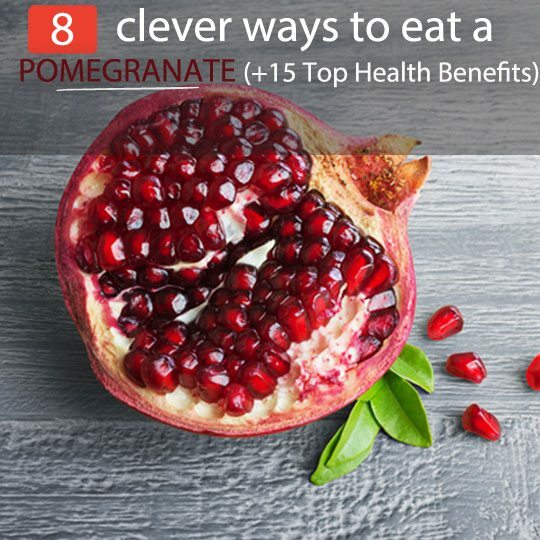 Moreover, pomegranates may also offer protection against leukemia and cancers of the colon by preventing structural changes that promote cancer growth. Impressive fact: The cell-killing and growth-inhibiting effects of pomegranates are limited to cancerous cells. 11. Pomegranates can help preserve dental health. Besides esthetic reasons and maintaining the function of your teeth, optimal dental health can also protect you against heart disease! It is now known that periodontal disease which affects the gums, bone and other supporting tissues of the teeth, can contribute to the worsening of heart disease. Including pomegranates in your diet can help you achieve optimal oral health. Research reveals that the fruit can fight dental plaque, the yellowish substance produced by harmful bacteria in the mouth which can lead to dental cavities and gum disease. Impressive fact: Pomegranates have been found to enhance gum healing, reduce gum bleeding and kill bacteria found in the dental plaque of healthy adults. 12. Pomegranates offer protection against infections. Cutting down your sugar intake and consuming pomegranates can help if you regularly suffer from infections. The fruit contains various compounds that can protect against yeast infections, including Candida albicans, and bacterial overgrowth. Impressive fact: Pomegranates possess anti-bacterial and anti-fungal properties that can protect against common infections of the gums (such as gingivitis, periodontis and denture stomatitis). 13. Pomegranates promote liver health. The liver requires, on a daily basis, a considerable amount of antioxidants to render harmless various chemicals, hormones, drugs and toxins. 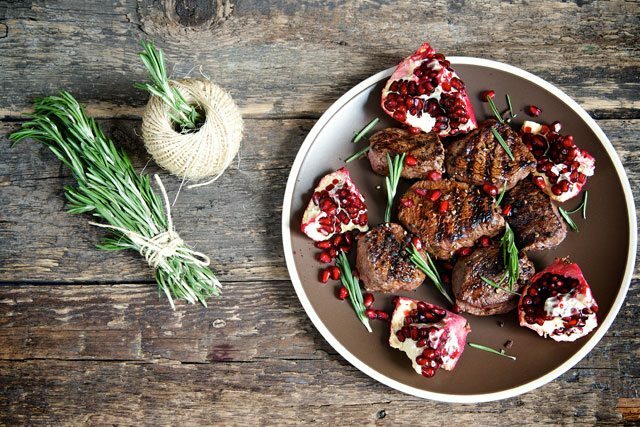 New research suggests that pomegranates are a potent source of liver-protective antioxidants. In a lab study, rats were given pomegranate extracts before being exposed to a stressor that usually causes liver toxicity. The results showed that the pomegranate significantly protected the rodents’ liver by maintaining high levels of vital liver antioxidants. Impressive fact: Pomegranate extract can effectively quench a variety of dangerous substances that can affect the liver. The extract also helps prevent structural changes that accompany liver damage. 14. Pomegranates protect the skin. Protect the skin against ultraviolet-A and B radiation which promote wrinkle formation and increase the risks of skin cancers. Nourish skin cells and help them regenerate and heal better. Promote collagen formation thanks to its vitamin C content – this delays skin sagging and wrinkling. Impressive fact: Aging skin often becomes thinner and heals more slowly, leading to the appearance of wrinkles and fine lines. The various nutrients in pomegranate can help slow down this aging process. 15. Pomegranates can improve exercise performance. Pomegranates are naturally rich in dietary nitrates which have been shown to improve exercise performance by boosting blood levels of nitric oxide (NO). Higher blood ‎concentrations of NO widen blood vessels, decrease the amount of oxygen which muscles ‎need for energy (ATP) production and improve the efficiency of muscle contraction. Put ‎simply, having more NO in your blood when you exercise make your muscles more effective at ‎utilizing energy. Impressive fact: Runners given 1 gram of pomegranate extract 30 minutes before running on a treadmill experienced a significant improvement in blood flow which delayed fatigue onset and improved overall performance. Have you ever tried cutting a pomegranate in half, pushing on the center a bit and then whacking the back of the fruit with a wooden spoon? Or maybe you’ve tried the ‘under water’ method where you soak the scored fruit in a large bowl of water for about five minutes then break the fruit’s sections apart with your fingers? 1. Using a paring knife, remove the flower end at the top of the pomegranate. You want to cut at an angle, removing a cone of pith from below the flower end without reaching any of the seeds. 2. Slice the bottom of the fruit. 3. Cut along the ridges – this is where the fruit naturally separates — through the pomegranate’s rind and most of the way through the white pith. 4. Break the fruit open by detaching each segment and remove the arils by gently peeling off the white membranes. If you find it hard to detach the membranes, simply place the fruit in a bowl of warmish water. This seems to help soften the pith up enough to complete the task. The pith will float to the top of the water and can easily be skimmed away. 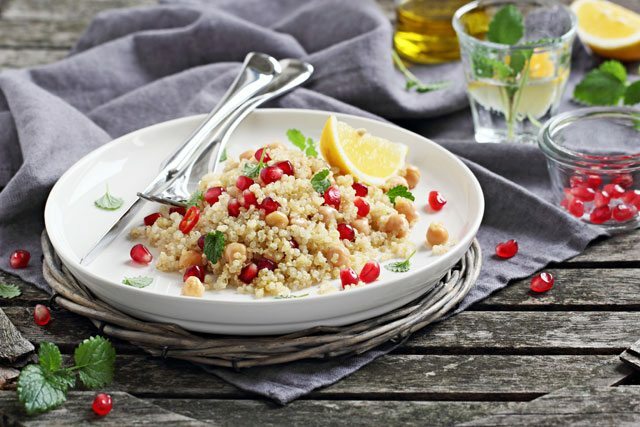 Use a colander to collect the pomegranate seeds. Need a morning boost? 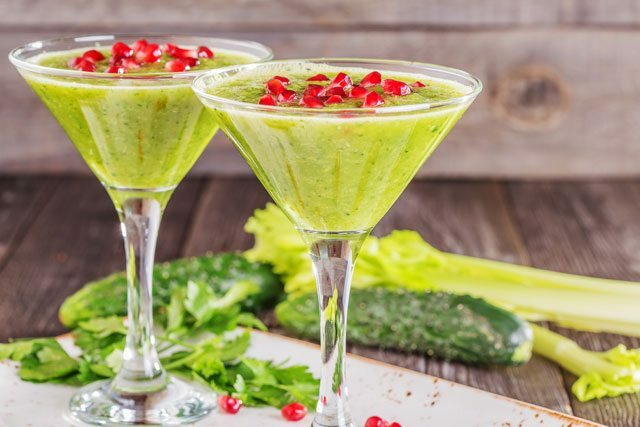 This green smoothie is just the thing you need. Don’t let the word ‘green’ scare you; besides the light green color of this delicious drink, you’d never know there was spinach in it. (i) Use 4 cups of spinach to add some extra fiber or add 2 tablespoons of ground flax seed. 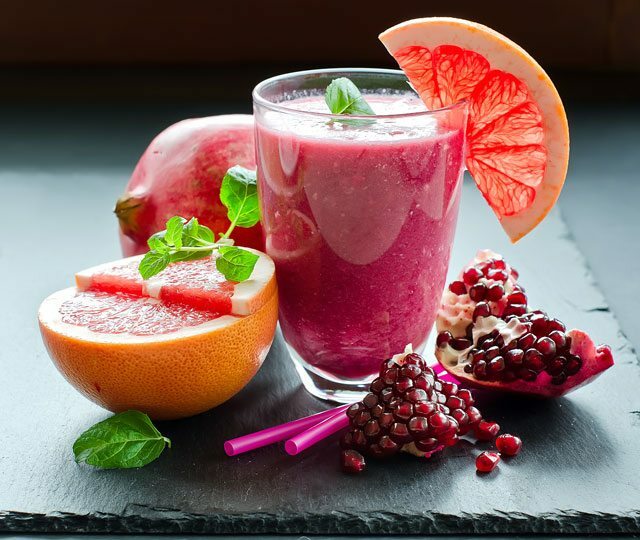 (ii) Use 1 cup of pomegranate juice instead of orange juice. (iii) Add only half a banana and 1 tablespoon of unsweetened peanut, cashew or almond butter. If you’re not a nut butter fan, you can add a quarter of an avocado or about 2 tablespoons of coconut flakes. You can also use kale, bok choy, collard greens and lettuce if you don’t have any spinach on hand. For a frothier smoothie, simply add some ice cubes or slice your banana and freeze it before adding it to your blender. 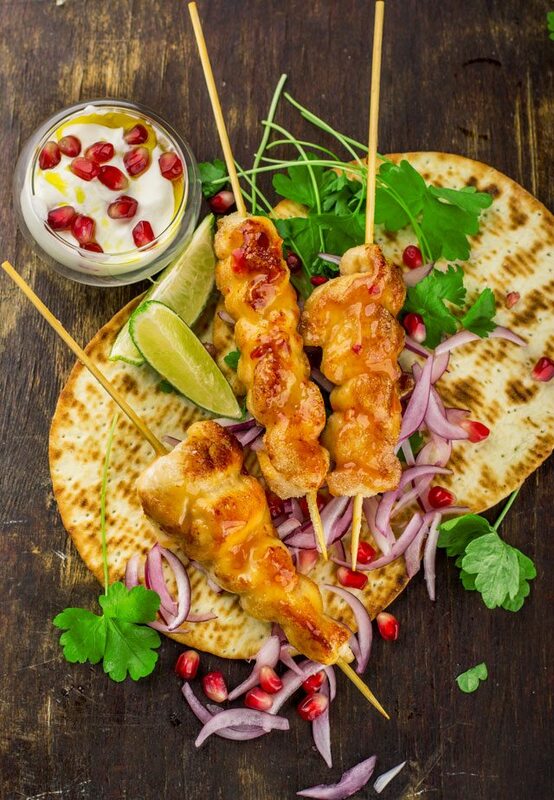 For a complete meal, simply serve with some left-over chicken or beef strips. 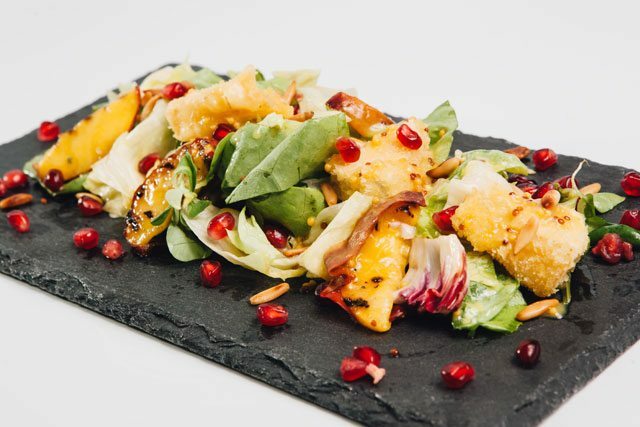 This salad also goes really well with baked wild salmon and tandoori chicken. 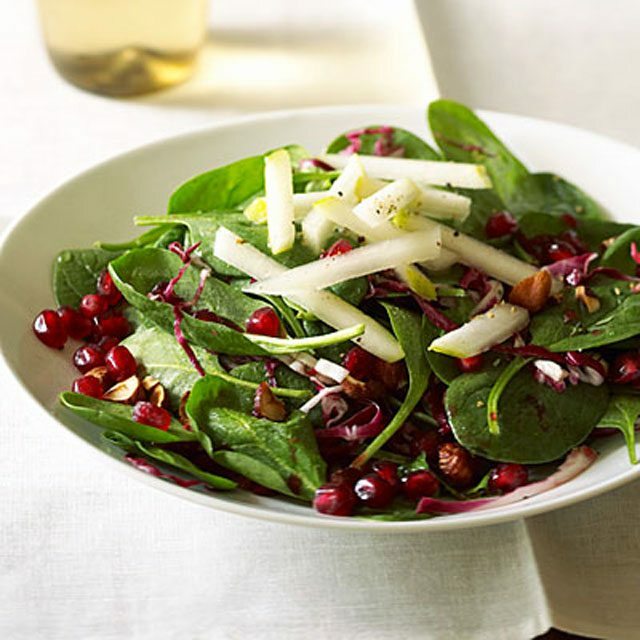 You can also use a crispy granny smith apple instead of pears or chopped fresh figs. If you’re allergic to hazelnuts, simply leave them out or add some pumpkin seeds or pepitas instead. This being said, I strongly suggest you make your own coconut milk with coconut flakes, a blender and cheesecloth. Here’s a video to show you how. The canned versions often contain Bisphenol-A which has been linked to various health issues and guar gum or soy lecithin which, from professional experience, causes lots of gut issues in susceptible individuals. Moreover, if you suffer from inflammatory bowel syndrome (IBS) and inflammatory bowel disease (IBD), you may want to avoid coconut milk altogether until your gut has healed. 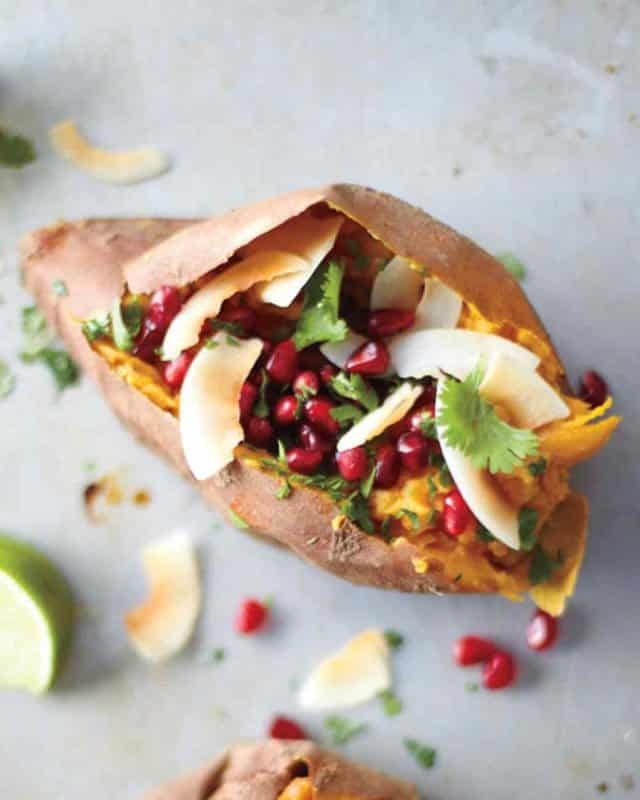 Looking for a delicious side dish that can be prepared in a jiffy? Then, why not give this recipe a try? 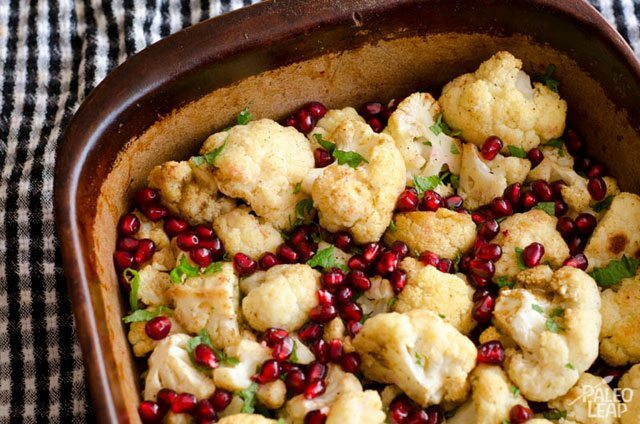 You’ll also be getting a nice dose of vitamin C thanks to the cauliflower and pomegranate as well as various antioxidants. This cauliflower-pomegranate combo goes really well with stir-fried beef strips, sweet and sour fish and coconut chicken curry. Bonus: the various colors in this dish will serve to liven up your meals. 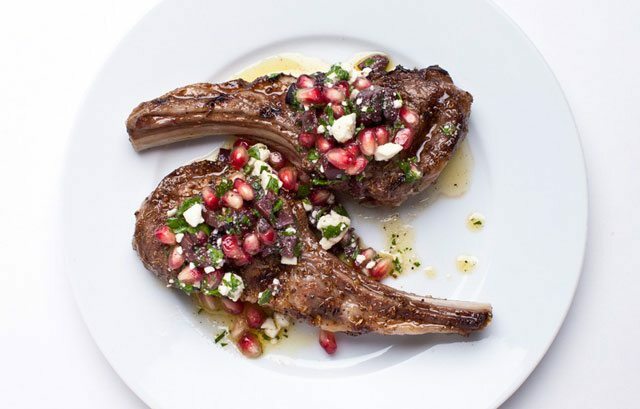 The tart flavor of the pomegranate gives a really nice contrast to the lamb chops. This dish goes well with mixed green salads or broccoli sautéed in garlic butter. If you can’t tolerate cheese, simply omit the feta cheese – you can also add a little bit of a nut butter you fancy. This one may sound complicated but I assure you it’s really easy to do and can be prepared quite rapidly. If you’re fed up with chicken, just serve the chutney with some sautéed beef strips, baked wild salmon or some turkey. I find that this dish pairs really well with crunchy veggies like grated cabbage, carrots and baby beetroot; chopped watercress or diced cucumbers. Want to impress your guests with a healthily decadent dessert? Or do you simply want a yummy but healthy treat? 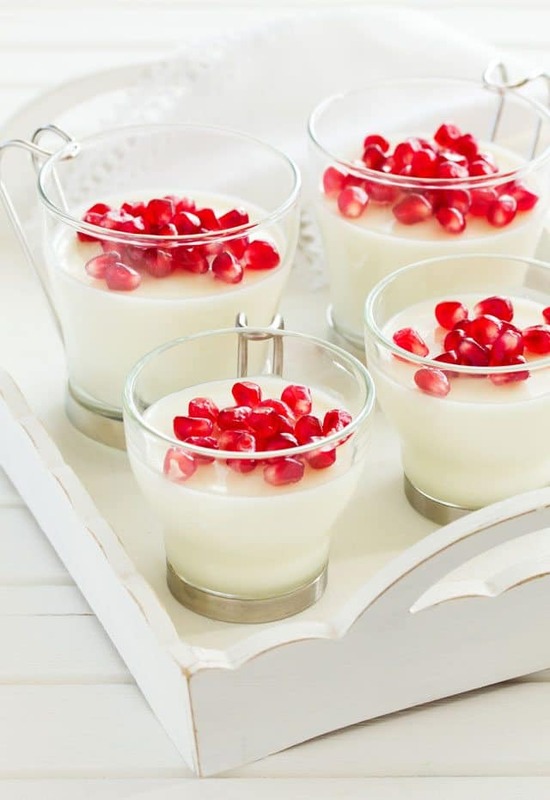 Then this coconut mousse is a must-try – it combines pomegranate juice with coconut milk and coconut flakes. Don’t let full fat coconut milk scare you – as mentioned earlier, coconut milk is rich in medium chain triglycerides which have numerous therapeutic effects. Plus this dessert won’t send your blood glucose levels on a roller-coaster. 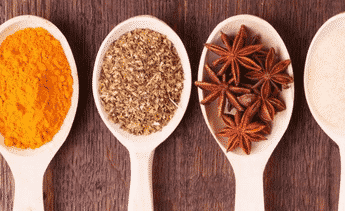 This recipe calls for stevia which I don’t recommend you use since it has a considerable impact on autoimmune disease development and progression. Plus I think that ¼ cup of honey is more than enough but feel free to add a little bit more if you don’t have blood glucose management issues. To reap the most benefits from pomegranates, try to consume mostly real foods, i.e. foods your grandparents would recognize. You may also want to look into probiotics when it comes to improving your mental, heart, immune, skin and dental health. If you’re planning to buy probiotics, be sure to choose a quality probiotic supplement. 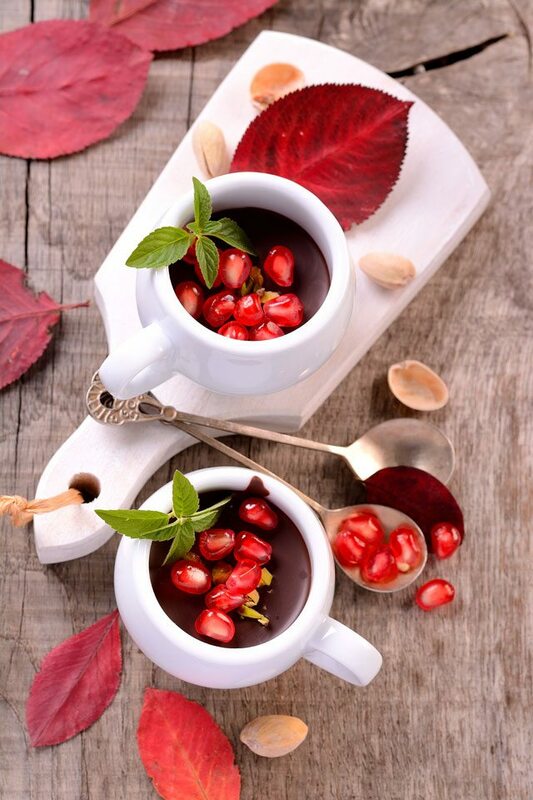 Do you have any favorite pomegranate recipe? Share in the comments below or on Bembu’s facebook page. 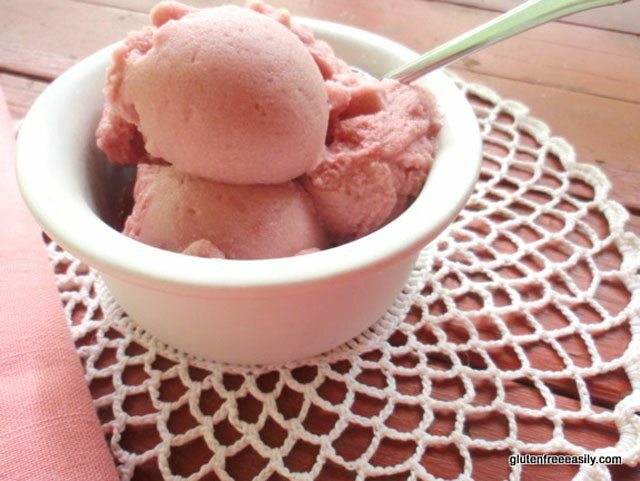 Because of the natural sweetness of the strawberries this recipe has no refined sugar in it. I added a little honey to the base & topping to help bind the dry ingredients together. I also added a little honey to the fruit layer to give the bars an extra little floral sweet note. Honey and strawberries are perfect partners.These little bars make perfect afternoon pick-me-up’s. Or served as part of a more indulgent dessert, covered with fresh cream or a lovely vanilla ice cream would really take these little bars up a notch.Which sounds good to me. Its strange, when its Spring and Summer I dream of Autumn and Winter flavours but when its Autumn and Winter I dream of Spring and Summer flavours. I have been known to spend a small fortune on fresh imported strawberries in the height of Winter. Hallelujah I saw sense and now buy frozen fruit when it is out of season….. so much cheaper. Which basically means these bars can be enjoyed year round!